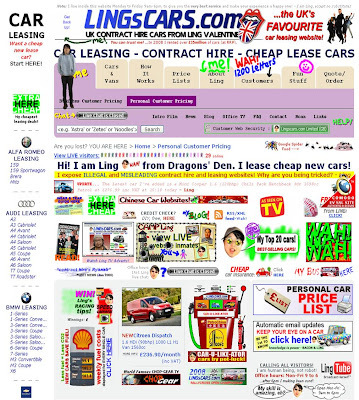 Part of the LingsCars.com crazy homepage! However whilst Dragons Den is free publicity, you can't keep going back (though Ling claims the re-runs on 'Dave' continue to drive website visitors.) Ling has achieved some marketing / advertising coups in recent years (from being featured on TV to becoming a comic strip character in adult comic Viz), but simple blogger outreach, with some controversial quotes, can widen coverage and the number of linking sites - bringing the LingsCars site to an ever wider audience and boosting SEO rankings too.